I grew up on a lot of bbq chicken recipes. Just like macaroni and cheese, it seems like everyone in my family has their own way of preparing baked bbq chicken. This is my grandma Barb’s recipe. I feature a lot of her down home, tried and true recipe son this site, like her fluffy yeast rolls, moist cream cheese pound cake and cornbread dressing to name few. They never disappoint which is why I’ve been begging her to create a cookbook. 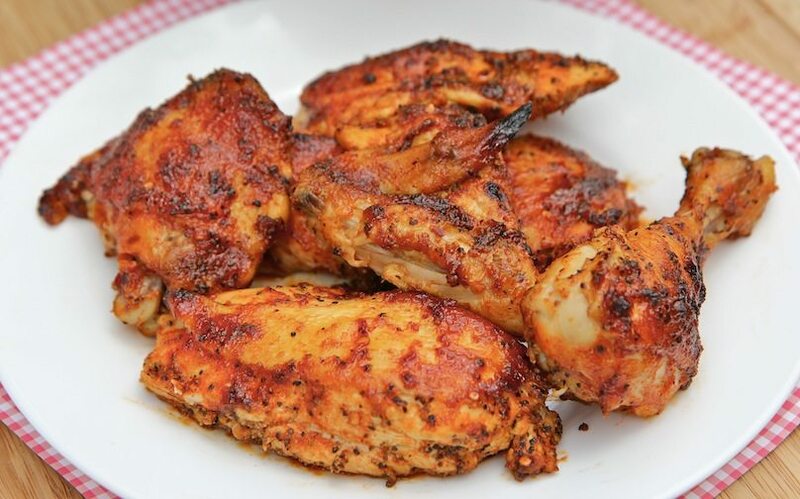 This bbq chicken recipe is pretty easy. It’s super juicy and tender. Grandmother would whip this up on weekdays and serve it with roasted corn, stove-top mac n cheese, yeast rolls, green beans and of course some good ol’ fashioned, ice cold sweet tea to wash it all down. Ahhhh…to be a child again. I didn’t know how good I had it! Out of all the baked BBQ chicken recipes I make, my son seems to like this one the best. I guess because it’s not to spicy or smokey. Watch me make this easy, baked bbq chicken recipe from start to finish! Place chicken on a foil-lined baking sheet and season both sides generously with garlic pepper seasoning. Mix all of the remaining ingredients in a bowl to create the bbq sauce. Place the sauce in the microwave to melt the butter if needed. Cover both sides of the chicken with bbq sauce. Bake skin side up for 40-45 minutes, basting with the bbq sauce every 15 minutes. Turn the oven to broil for the last two minutes of baking and broil for 1-2 minutes to crisp up the skin. Watch it carefully. Remove from oven and let chicken rest for about 5-7 minutes before serving. ~TIPS~ For a more smokey flavor, sprinkle the chicken with hickory salt or liquid smoke before baking. Be careful not to over cook. Depending on the size of your chicken, you may need to adjust the cooking times.